Race in events from the 5k to the marathon along some of the most spectacular vistas in the UK. These races are great for all runners, with the longer races providing some challenging inclines. Come if you want to experience a unique coastal run. At the Start/Finish there will be a bag drop, coffee and cake for sale, along with hot food and every finisher will get as always a really super medal, there are also many beautiful places to eat a proper meal after you have finished your run, booking is advised, please mention us. Starting just next to Marsh barn, in the old pitch and putt gravel area the trail run takes us through the beautiful golf club and onto freshwater. 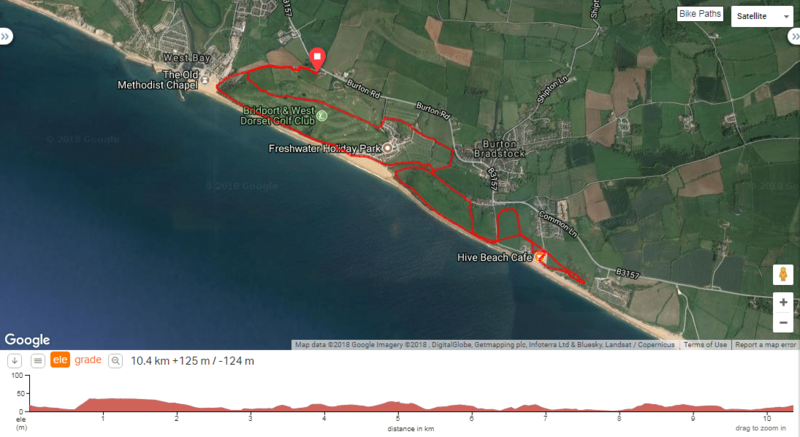 It's flat for the first 3 km which is where the First Aid station is located, after this the route follows the Jurassic coastal path through freshwater and you return to West Bay (Marsh Barn) along the Jurassic cliffs, with views along the coastline. Again Starting just next to Marsh barn, in the old pitch and putt gravel area the trail run takes us through the beautiful golf club and onto freshwater. It's flat for the first 3 km which is where the Aid station is located, after this the route follows the Jurassic coastal path out to Hive beach, Burton Bradstock, before we head westwards and then follow the path back to the Aid station at 8 km, its cliff path, and sea views all the way back to West Bay (Marsh Barn) along the Jurassic cliffs. The Half marathon is a test in places and not to be taken lightly, starting just next to Marsh barn, in the old pitch and putt gravel area the trail run takes us through the beautiful golf club and onto freshwater. It's flat for the first 3 km which is where the First Aid station is located, after this we meet our first hill - it's short and sharp. At the top we get our first glimpse of the sea before we head for Burton Bradstock's hive beach, once through the fields, we follow the coastline and head inland for a km, and the second feed at 10 km before heading back towards Hive beach, it's all downhill and is track and trail. We link back up with the 10 km route here and head towards the third feed at 17 km, this is when the fun really begins, once on the cliff path, you will realize why we have chosen this location. It is simply breathtaking, and the views (If there is no mist) are to die for. It's the Jurassic coast at its most superb. The first parts of the Half are relatively flat but it is the Jurassic coast so at some point it's an up and down challenge that is not for the faint hearted. An addition to the 2019 event will see us add a full trail marathon. It's tough, very tough, and the cut off at 18.5 km will be strictly enforced, but for those that are up for the challenge, come and run spectacular scenery. From the East follow the M3 and M27, journey times from the M25 are in the region of 2 – 2.5 hours. From the West follow the M5 and then the A30 onto the A35, Journey times from Exeter are about 1 Hour. From the North follow the M5 till Taunton and then the A358 to chard, From Taunton it's approximately an hour. Parking for the event is next to the start and 300 metres from registration, parking is £2.00 per car (CAR SHARE WHERE POSSIBLE). There are no Train or Bus services to the event. We went the wrong way and ran another 3 km!! When do we get our race packs? Hi there. Just to let you know race packs are collected at registration on the morning of the event. Is it possible to cancel if we can no longer make it? I am interested in the half marathon, never done one before. What food and drink are given on the way around to keep you going? Is it just a medal you get for completing? How do you know what time you finish in? Thanks! Hi there. Just to let you know that there is a feed station along the half marathon course which will have water and other fuel to keep you going. You do receive a medal for completing the event and you will be able to see your finish time either directly after the event, or it'll be emailed to you. Good luck! Hi, is it possible to get an entry on the day or have all the places for the 10k sold out for good? Hey there, just let you know that they will not do entries on the day as the event is already at full capacity. All the best!